There are so many food blogging events, I'm getting a headache - which is why this particular one, Taste & Create, appealed to me so much. Most of the hard work is done for you already, by another food blogger! Well, it's an incredibly simple idea. 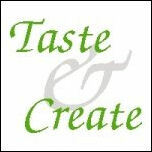 You are randomly paired up with another blogger from the long list of participants and you are asked to look through their blog posts and make a dish that looks interesting to you. On hearing that I was paired up with Steph, from a whisk and a spoon, I spent a happy hour browsing through her collection of recipes and drooling over her fabulous photos. I finally decided to go with a sunny lemon polenta cake, that she had made for an event requiring cornmeal. 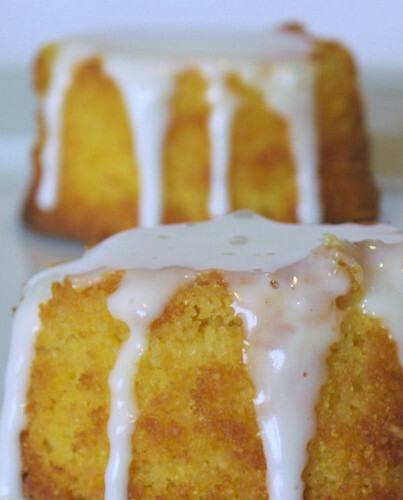 These little cakes had a surprise under the lemon icing - they had been drenched in a lemon syrup! Not having cooked with polenta before, I had to go and buy some. I dusted off my friand tin, as I wanted individual cakes like Steph had made. 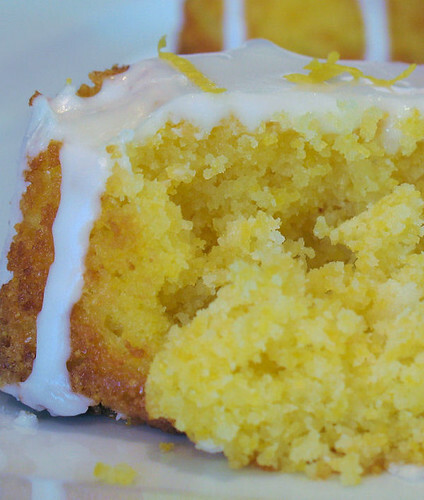 The recipe was easy to follow and the cakes turned out beautifully, although this is one lemon delight that must be eaten with a fork, as they were very crumbly. I really liked the texture of the cakes, the coconut gave a little chewiness and the zing of the lemon really added to the flavour. Thank you to Nicole for her brainwave, and to Steph for the recipe! While looking for a way to use up some dried cranberries, I came across this Bill Granger recipe which was printed in the November issue of the Observer Food Monthly magazine. 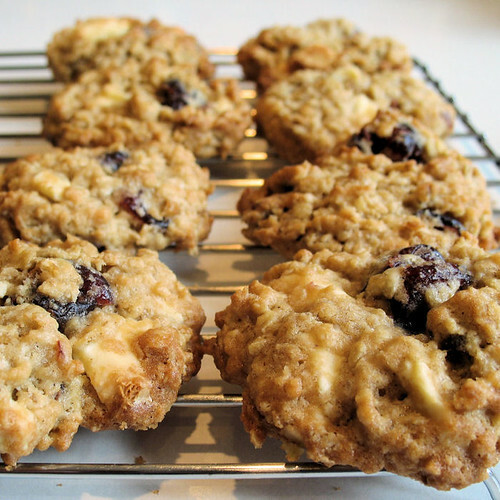 The cookies are packed full of oats, cranberries and chocolate. They are soft and chewy with a delicious tang. Preheat the oven to 180°C/gas 4 and line three baking trays with baking parchment. Cream the butter and sugar together until pale and creamy. Add the egg and vanilla and beat until smooth. Sift the flour, baking powder and salt together. Add the oats, chocolate and cranberries and stir together. Add to the creamed mixture and stir together well. Roll small tablespoons of the mixture into balls and place on the baking trays. Flatten the balls with a fork dipped in flour. I haven't had Nutella for years, but when I saw that Ms. Adventures in Italy was hosting a World Nutella Day, I just had to buy some to join in. And I'm glad I did - it's just as delicious as I remember it being - I had to stop myself from eating it straight from the jar! It brought back all sorts of childhood memories. When we had a jar in the cupboard, it was usually my brother who piled it onto his toast, leaving it with a ton of crumbs for the rest of us! So, for World Nutella Day, I came up with these little crispy nibbles, and found it's impossible to just eat one! 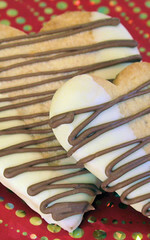 One of my own creations - the Nutella cream could also be used in a variety of recipes instead of plain whipped cream. Heat the oven to 180º. Cut the sheets of filo pastry into rounds using a cookie cutter, you want to use one that is just bigger than the holes in a mini muffin tin. Brush each one with melted butter and layer 3 in each muffin hole. Bake for about 8-10 minutes, or until just turning golden brown. They are quite fragile, so carefully ease them out of the tins and cool on a wire rack. They will keep for a couple of weeks in an airtight container, until ready to fill. 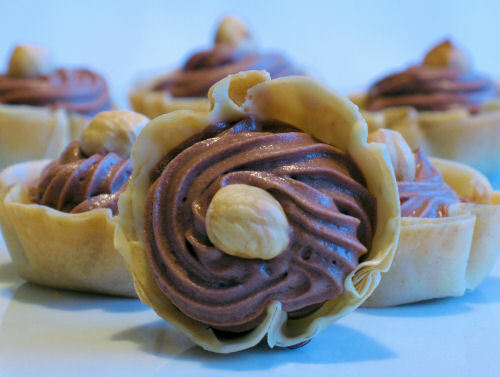 Using a small silicone pastry brush, brush the melted chocolate onto the inside of the filo cups. Repeat this step so you have a double layer of chocolate. 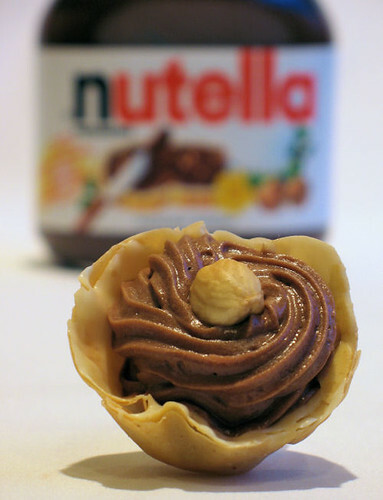 Whip the cream to soft peaks and gently fold or whip in the Nutella. 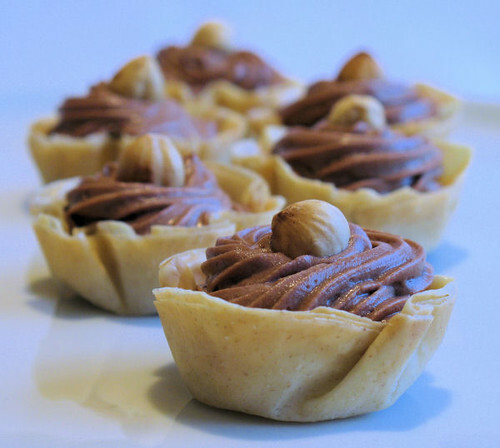 Pipe or spoon into the filo cups and pop a roasted hazelnut on top of each one. You can see the round-up at Ms. Adventures in Italy and at Bleeding Espresso. These ginger biscuits have more than satisfied the cravings for ginger that I've had lately. Dip them into chocolate and you have the perfect adult biscuit. 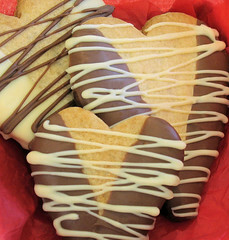 I will be sending these along to one of my favourite food bloggers, Zorra from Kochtopf, who is hosting A Heart For Your Valentine, an event which showcases edible heart shaped delicacies. 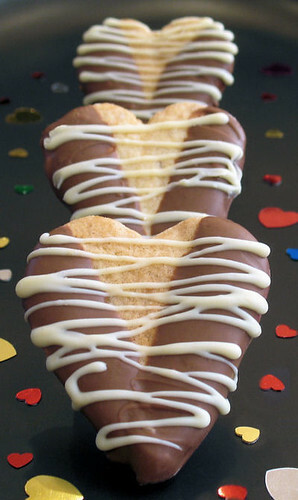 The round-up is being updated with incoming entries, and is full of fabulous food ideas to make for Valentine's Day. 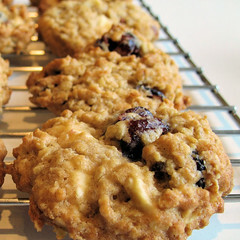 Heavily adapted from a gluten-free ginger biscuit recipe. I also had to add half an egg, as I was having trouble getting the dough to come together properly. You can cut down on the amount of crystallized ginger if you want. In a large mixing bowl, beat the butter and sugar together until light and creamy. Add the plain flour, baking powder, ground ginger and the finely chopped crystallized ginger. Stir to form a stiff dough, adding the beaten egg gradually. Roll out the dough onto a lighly floured surface to about 3mm thick and cut out with a cookie cutter. Place the shapes onto baking sheets and place in the fridge for half an hour or so. You can re-roll the the trimmings to make more biscuits. Pre-heat the oven to 180ºC/360ºF and bake the biscuits for about 15 minutes, until pale, golden and just crisp. Transfer onto a wire rack to cool and dip into the chocolate, or drizzzle melted chocolate on top. Leave to set.